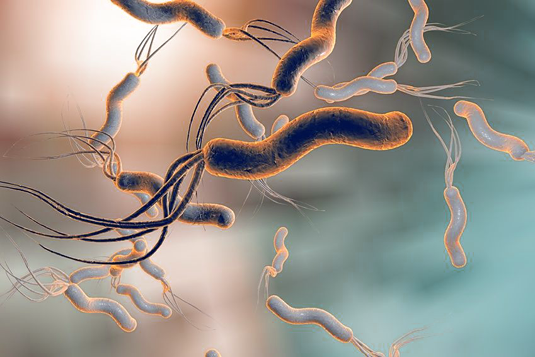 The cosmopolitan bacterium Helicobacter pylori, which colonizes the mammalian gastrointestinal system, is responsible for one of the most common microbial infections in humans. Many Helicobacter infections provoke no overt symptoms, while others induce various types of gastrointestinal disorders, such as gastric ulcers. However, the most serious consequence of infection with H. pylori is that the microorganism can induce the development of cancer of the stomach. One of the most striking features of the species is its genetic diversity. Research groups led by microbiologists Professor Sebastian Suerbaum and Professor Christine Josenhans at LMU’s Max von Pettenkofer Institute have been exploring the significance of this feature for its ability to survive in its human hosts. They now report the identification of a particular enzyme that plays an important role in coordinating the regulation of gene expression in the pathogen. The protein belongs to the class of enzymes known as DNA methylases, whose function is to attach a chemical tag known as a methyl group (CH3) to specific sequence motifs in DNA. Methylation of DNA in bacteria was first described as the self-protective arm of a primitive immune system, which recognizes unmethylated DNAs as foreign and selectively destroys them. However, it is now known that DNA methylation systems in bacteria play a variety of other roles in relation to the control of gene activity. Moreover, this function is apparently so crucial for the survival of H. pylori in the stomach that the newly identified methylase is found in every one of the over 450 strains of the species investigated in the new study. In contrast, many other members of the same enzyme family are found in only a small subset of the strains examined. The new findings are described in a paper that appears in the journal Nucleic Acids Research. Lead author of the report is doctoral student Iratxe Estibariz. In virtually all domains of life, methyltransferases play a crucial role in ‘epigenetic’ processes (i.e. regulatory mechanisms that depend on alterations in the chemical structure but not the sequence of nucleotide bases in DNA) that enable organisms to adapt rapidly to changes in environmental conditions. Methylation of DNA as a mode of regulating gene expression was originally discovered in humans – where methylation of specific DNA sequences serves to render the genes affected resistant to activation. “However, the role of epigenetics in bacteria has been little studied so far,” says Sebastian Suerbaum. Together with Christine Josenhans’ group, he has now shown that the methyltransferase JHP 1050 has a very significant effect on gene expression in H. pylori. Genetic inactivation of the enzyme results in defects in cell growth and shape, and negatively affects the bacterium’s capacity to adhere to host cells. “Our work demonstrates that practically all the biological properties that are relevant to the interactions between H. pylori and its human hosts – bacterial metabolism, motility and stress resistance, interaction with host cells – are all regulated by global methylation, and it shows that this process endows the bacterium with the flexibility needed to adapt its pattern of gene expression to changing environmental conditions,” says Christine Josenhans.